The short answer is no, projects are not required to show up on your Schedule. A project’s start and end dates determine where the project will be blocked out on your Schedule. But you might have a project that you really don’t need to block out on the Schedule at all. 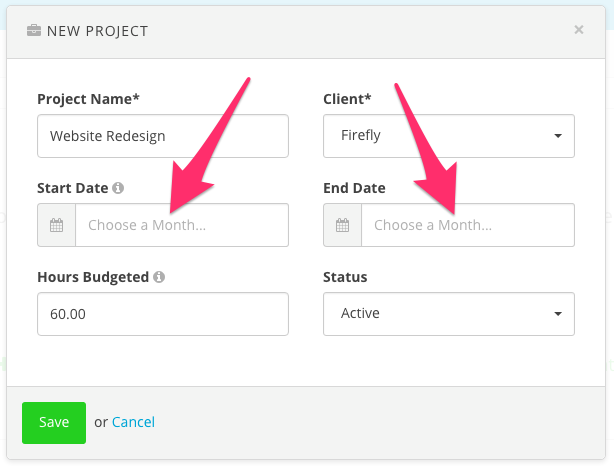 In those cases you can leave a project's Start Date and End Date fields blank. For example, a web developer might have a client who gets invoiced on a regular basis for web hosting and general maintenance. The web developer would like to group these invoices and any tracked time for general maintenance within a Harpoon project, but because the work is ongoing and sporadic the project doesn’t really need to be blocked out on the Schedule. In that case the start and end dates for the project can be left blank. Note: Leaving your start and end dates blank for a project will not prevent invoice payments for the project from showing up on your Schedule. In other words, your tracked revenue on the Schedule will still be accurate even if you have projects without start and end dates. To learn more about scheduling view the Schedule support articles.